WHEN you've clocked up more than 50 years of service to the sport you love, you would be forgiven if you decided to give it away, but that's not Colin Cunningham's way. From club level to association level and even umpiring, the Gretna veteran has done it all when it comes to the game of cricket over the last 54 years. In recognition to his outstanding achievement, Cunningham was presented with a framed certificate and pin from Cricket Australia and Cricket Tasmania at the end of the last season. The award was presented at the Gretna Cricket Club's annual dinner and trophy night. Gretna Cricket Club for 19 seasons: 1963/64 to 1965/66; 1967/68 to 1968/69; 1988/89 to 1998/99 and 2014/15 to the present. This includes service as a committeeman, premiership captain and playing in six premierships. New Norfolk Cricket Club (1966/67), playing one season in the then TCA. Prahan Cricket Club in Melbourne for one season (1970/71) where he trained with VFL/AFL great Kevin Sheedy who was also at the club. Glenora Cricket Club for three seasons (1969/70 and 1971/72 to 1972/73) playing in one premiership. The club then merged with Ellendale to become the Glenora/Ellendale Cricket Club where Colin had 16 seasons (1973/74 to 1987/88 and 2000/01) and served as president, secretary and captain, played in three premierships and was made a life member. Colin was president of the Derwent Valley Cricket Association for 17 seasons (1989/90 to 2005/06) and was made a Life Member in 1985. He played Country Week for many years where he played in the DVCA No.1 team that won the 1973 Country Week Southern Championship, captained by the late Lyn Harris. Administrator and coach of the Derwent Valley Junior Cricket Association for nine seasons (1993/94 to 2001/02). Umpired in the Derwent Valley Cricket Association for three seasons (2003/04 to 2005/06) and the Southern Cricket Association for nine seasons (2006/07 to 2014/15). In 2000, Colin was awarded the Australian Sports Medal at a function at Bellerive Oval for his contribution to cricket. Grand finals played in (DVCA): One A-Grade premiership, nine B-Grade premierships and five B Grade runners-up. 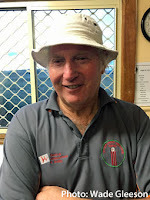 Colin has been a proud cricket volunteer and for many years he served at both club and association level in the same seasons. What also makes his contribution all the more outstanding is that he has also served on the Gretna Fire brigade as volunteer for the past 30 years. Colin has held the position of brigade chief since 1987 and junior co-ordinator since 1996, guiding and training the brigade's younger members. Colin was president of the Bushy Park Hall Committee for 10 years and is currently the vice-president. Colin's father, the late Les Cunningham, played for Gretna from 1927 through to the 1960s including many premierships and mostly as captain. Les was one of the Derwent Valley's greatest cricketers, scoring more than over 50 centuries and also played more than 25 years of Country Week for the Derwent Valley Cricket Association. Les and Colin both played with Gretna during the 1960s, opening the batting together and also played in the 1964/65 DVCA A-Grade Premiership together. Colin's sons, Craig and Jason, have also played for Gretna with Craig recently playing his 200th club game. Colin's grandson Josh Farrow has also played for Gretna, coming up through the juniors. Colin's first memory of starting out his cricket career with the Gretna Cricket Club was riding his bike from the Woolpack Straight at Gretna down to the Gretna War Memorial Oval to training where he would field mostly and occasionally get a bowl. After one of Colin's early matches with Gretna, Second XI captain Billy Wilson-Haffenden brought a tray of glasses of raspberry cordial out of the National Park Hotel for Colin and the other boys as they were too young at the time to go into the bar. The last game Colin played was on January 27, 2001, just a month before the left-hander turned 52. He scored 60 runs including eight fours and also took a catch while playing for the now defunct Glenora/Ellendale Cricket Club. Colin was a good right arm medium pace bowler in his early days and later reverted to off spin. Colin still volunteers his time to cricket, being involved with the Gretna Cricket Club as senior coach and also helps out with many jobs such as the running of the canteen and match day duties. Colin is a respected member not only with in the cricket family, but also in the local community. Well done and congratulations Colin, you certainly have earned this recognition.